In the worldwide molten salt movement, Terrestrial Energy (TE) stands out as the company that may hold the best cards to show the first working molten salt reactor since 1969. The company has appointed the year 2024 for this milestone, an ambition that is supported by apparently sufficient brainpower and funding. The expectations are also based on the personality of founder David LeBlanc, who combines visionary, technical and communicative skills with a high dose level of pragmatism. Pragmatism may well be the key characteristic of the development process of the Integral Molten Salt Reactor (IMSR), which is the projected key technology for TE. In the very opening sentences of his presentation on the Thorium MSR Symposium in Delft, April 17 2015, LeBlanc points out that molten salt reactors can be designed in many, many ways. When listening to LeBlanc, many of the fora discussions on certain properties of MSR’s start sounding offbeat, as none of the designs under discussion have reached a final decision, and properties depend on design choices. When talking to LeBlanc, the properties of MSR’s start reminding one of the output of a sound mix table at a rock concert: it all depends on where you put your sliders. This picture was taken in Delft, April 17, 2015. Twelve people, representing six molten salt reactor startups. 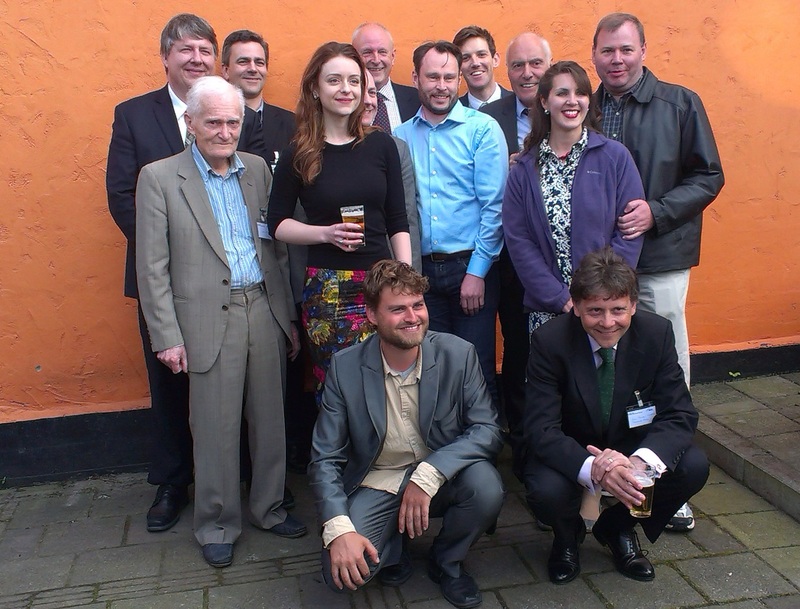 Back row, left-right: David LeBlanc (Terrestrial Energy/TE), Götz Ruprecht (DFR), Ian Scott (Moltex) Rory O’Sullivan (Energy Process Developments/EPD, preparing UK report with MSR assessment), John Durham (Moltex) Kirk Sorensen (Flibe Energy) and his wife, front row left-right Jasper Tomlinson (UK, EPD), Leslie Dewan, Thomas Jam Pedersen (Copenhagen Atomics) front right Louis Plowden (TE), front left Cyril Langelaar (TE) – Cyril wrote the new wikipedia page on the IMSR. Crucial to all this mixing and tuning of reactor concepts is the molten salt. The liquid fuel is the key to the fact that the designer is able to slide his sliders. It allows him to come up with a reactor that specifically meets the needs of a world that wants boatloads of cheap and clean energy. The design flexibility, made possible by molten salt, may even allow designers to come up with a concept that has the potential of being embraced by a world that has some twisted ideas about nuclear energy, and that needs considerably more assurance and safety controls than would be necessary from a strictly technical point of view. In other words: the safety properties of IMSR designs under consideration are remarkable, while the cost per kWh installed and the price per kWh produced are still very competitive – although the more precise cost calculations still have to begin. GZ Your company is planning for three different sizes of reactors. Let’s decide which model we’ll talk about so we know what we’re referring to. DL I think I have the numbers for our 80MWth reactor ready, so let’s talk about that one. GZ I’d like to know what goes in and what goes out. So let’s start with the initial load. DL This smaller unit would have about three cubic meters of salt, roughly containing 100 – 150 kilograms of fissile, initially probably U235. For this smaller unit the enrichment level will be around 4%. In these salts, about half of the weight will be the uranium, because uranium is so heavy. G And what salts are you going to use? DL We have options here, and we have not yet made our final decision. I can’t go into the details yet, but the choice is to either use or avoid flibe salts**), or specifically avoid the use of enriched lithium or beryllium, both of which are expensive. We need more information before we can make a final choice. Enriched lithium is not currently available but may be in the future. Both these elements produce tritium that has the property that it can pass through hot metal and we have to handle that. But it’s important to know we do have the option to avoid lithium and beryllium. We may choose to use them anyway because in other respects they give you a superior salt. They are neutronnically the best, so you will need a bit less fuel per year, and they are the best buy on heat transfer – I can’t give details but we definitely have the option to use non-flibe salts. That is one of the big advantages of building a burner, rather than a breeder: being able to do without flibe and being able to do without processing. GZ I understand that it’s being a ‘burner’ rather than a ‘breeder’ is what distinguishes IMSR from other molten salt reactor concepts, and the main reason why you consider it the more ‘doable’ of MSR concepts. G Ok, once the production is going, noble gasses like krypton and xenon start to form. These are notorious for gobbling up neutrons and spoiling the nuclear reaction. Will you have to remove these gases? DL We have to deal with them because the xenon and krypton come in several isotopes and some of these decay into radioactive products and need to be safely managed – like binding them to active charcoal and keeping them there while they decay. So we do have to manage the gasses that form, but we do not have to remove them rapidly, they come out of their own. The off gas system can be just a static device capturing the gasses produced. Our options extend all the way to sealing the gasses in, pretty much like every present day reactor does. GZ Let’s make a big jump here. You started out with 3-4% enriched uranium, meaning there’s 100 to 150 KG of fissile U235 on a total of 3 to 5 tonnes of uranium. After seven years, what do we find in the nuclear soup within the IMSR? DL In those seven years, we have added small amounts of makeup fuel, so we started with about three cubic meters and we’ll end up with a bit more. That’s no problem: there is adequate space within the reactor vessel for the salt volume to expand. In this fuel salt are fission products, of course, there will be some fissile uranium left and there will be very small amounts of transuranics, most of which will be plutonium. What exactly will be in there depends on certain choices we still have to make. We have the option of adding thorium fluoride. One big choice is whether or not we will add this thorium. That especially is a very complex decision. GZ What makes it complex? DL Having thorium in the fuel salt or not has effects on about a dozen aspects. Unfortunately, I cannot completely uncover them at the present time, but I can assure you it’s a very interesting set of pro’s and con’s. I can say this: if we use thorium, we will want to use a higher grade of low enriched uranium, depending on what is commercially available and what the law will allows us. We may be able to obtain uranium with an enrichment grade of 9 to 10 per cent. But even at that percentage, the majority of the fuel will then be the thorium in the salt. After 7 years of operation if we have employed thorium, the remaining uranium in the salt will be a very attractive mix which will have modest amounts of U233, and a very small remainder of U235, and that uranium will be very attractive to recycle – I’ll come back to recycling in a minute. If we use ONLY uranium as a startup and makeup fuel, the uranium left will not be very attractive to recycle. It will be very low U235 grade, and will contain bits of U236. It will not really give us waste issues, it will only be very mildly radioactive, roughly comparable to the uranium that comes out of the ground. And as I said we will have produced plutonium (Pu) in very small concentrations. The reason that there will not be much left – plutonium will form through transmutation of the U238 fraction of the original fuel – is that in the thermal spectrum, plutonium has an enormous cross section for absorbing neutrons. This means that most plutonium that is formed simply fissions off. The small concentration of plutonium that is left will be a mixture of isotopes with a high fraction of Pu242, the highest isotope of plutonium and virtually if not literally impossible to use in a weapon. Also, the number of kg’s of plutonium at this stage will be very limited. After a cooling down period, many nations would feel quite comfortable sending this for treatment for geological storage. But there is a choice here. And that choice would be to recycle that plutonium and put it into another reactor. There is no rush to perform this action, so it could be after many years of safe on site storage which simplifies the process as radiation levels will have dropped significantly. Most of the transuranics will be plutonium, but there will also be traces of neptunium, curium – all of these can be put back into a reactor, but it’s important to note that there is actually a choice involved. Ultimately, it is the choice of the nation that is involved. By the way, talking about plutonium, there is a very interesting synergy possible between CANDU***) and IMSR. It is possible that one CANDU could feed three or more IMSR’s with fissile plutonium without the necessity of any enrichment facilities. As for the carrier salts: if we choose to use the enriched lithium, we will most likely recycle that, as it is very expensive. And as long as we keep on recycling all of the transuranics, the only ‘waste products’ are unused uranium and off course the fission products. Now these fission products are not really a problem. They need to be guarded and stored, but drop to quite low radiotoxicity after around 300 years – all of which makes the waste issue a lot more malleable to everyone involved. DL Yes, that’s the point. G Does recycling require that after 7 years you pull the fuel salt out of the nuclear power plant and transport it to a central facility? DL Not ‘require’ – the process can be designed in many different ways. First, any salt processing will be a significant economic undertaking and it helps that you certainly do not have to have processing facilities before the reactors begin power production. In the future then, we could start slowly by adding modest facilities to a reactor that would be able to recycle transuranics and add them to their own fuel. It is possible one could make mobile equipment, add ditches or bunkers on the locations, bring the equipment in and one could go plant by plant. Probably the best way would be to leave the used fuel salt on site for a number of years and then transport it in small, very rugged canisters to central facilities for processing. From there, the fission products could be prepared for geological storage, the transuranics could be put back into another reactor. Moving spent fuel is being done in many countries around the world. And for MSR’s, it is easier: you do not have to make the very long bundles of rods like the ones that come from present day reactors. You can use small canisters, that you can make extremely rugged. G My guess is that you and your team are all working on the IMSR – is the recycling aspect an integral part of that development or is it a separate process? DL Well, it is of course different from the design aspects but it is a very important part of our work. Any government that will be dealing with us will have to be dealing with their own public, so they will want to know our entire story, even before we build our first reactor. And we have investigated many different recycling scenario’s. It’s a bit of a strange situation too, as we have significant collaboration with many in the United States and they usually don’t talk about reprocessing fuel. This goes back all the way to the 1970s of president Carter – during that time the public became concerned about reprocessing capabilities and their relation to weapons proliferation risks. The Carter administration banned it although this likely had little effect on the history of nuclear proliferation. The law I think has been changed by Reagan, but the ban has been continued as a practice. As for the safety of the waste, there already is a very simple solution for that, there are very secure ways to store it in salt layers. This is a totally responsible storage solution, backed by science. In these salt layers, material first gets into rugged canisters, that get completely sealed in by the salt. Once firmly within the salt layer, material will not spread: scientists have concluded that any spreading is limited to inches over hundreds of millions of years. As for the cost of facilities like Yucca Mountain: these costs have everything to do with the fact that the political masters wanted storage to be such that we can pull it out of the ground later in case we change our mind. That’s what makes it expensive. One last thing. We have also done a lot of work on the best form of geological storage in case that route is chosen. We have spoken to one of the leading world experts in vetrification techniques and he has advised us to look at a technique termed Synroc. If a nation’s choice is to not attempt transuranic (Pu etc) recycle, i.e. to employ a Once Through Cycle, then the IMSR waste can already be just a small fraction the plutonium waste of current reactors. If transuranic recycle is performed, then the waste stream has very little long lived radiotoxicity. In fact in the long term the IMSR could then be seen to have transmuted or destroyed more existing long lived radiotoxicity than it produces. Secure storage of the shorter lived fission products is still an important duty but since this time frame is only hundreds of years for these, this task is relatively simple. To sum this all up: we quite precisely know our potential waste streams in case we choose different scenario’s. G But from the story perspective, is it not much more attractive to simply say: we have this great reactor, let’s burn the fuel all up. DL Well, it’s important to make the point that there is already a perfectly viable way to deal with the long term waste. But I agree that complete burning is the easier story to tell. *) If you want more of an introduction to the Integral Molten Salt Reactor, I can recommend to watch the presentations for the Delft symposium: http://www.thmsr.nl/. LeBlancs presentation starts apr. 1:53:00. **) Flibe is the name of a specific salt mixture that contains lithium fluoride and beryllium fluoride. ***) CANDU is an existing Canadian nuclear reactor technology that uses heavy water and natural, unenriched uranium.